Is the lived-in look on its way out? Not so fast! These fandeliers continue to give customers and clients that farmhouse feel they love so much. Old habits die hard, especially when they’re a little bit rustic, a little bit industrial and totally bursting with casual charm. Maybe that’s why — even when experts put their money on the unraveling of Farmhouse as the golden child of style — the look continues to pop up in unexpected places, and we still can’t seem to get enough. Fandeliers (chandelier + ceiling fan = one of best inventions ever!) are among the latest home decor categories to fall under the Farmhouse spell. Likewise, we’re swooning over Arcadian details like barn wood blades, Weathered Gray finishes, dark matte housings and mesh shades. We’re pretty sure your clients will love these Farmhouse fandeliers too. 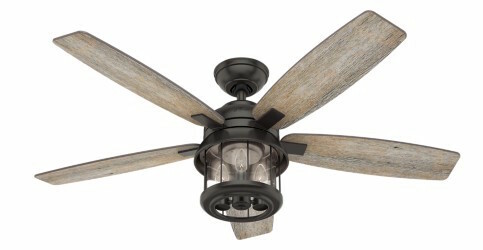 Vintage-style Edison bulbs (LED, of course) and seeded glass are the defining features of Hunter’s Coral Bay ceiling fan. But while the lantern-like light kit takes center stage, rustic details like the reversible blades’ barn wood/drifted oak finish complete the whirling Farmhouse package. This ceiling fan is a workhorse too. Your clients can enjoy Coral Bay’s big chill from a covered porch or patio thanks to the versatile design’s damp rating and quietly powerful three-speed WhisperWind® motor. Though Farmhouse design could hardly be described as stark, there’s not a lot of room in the coveted aesthetic for things that are purely for show. Monte Carlo is a stunning example of getting the form and function mix exactly right. 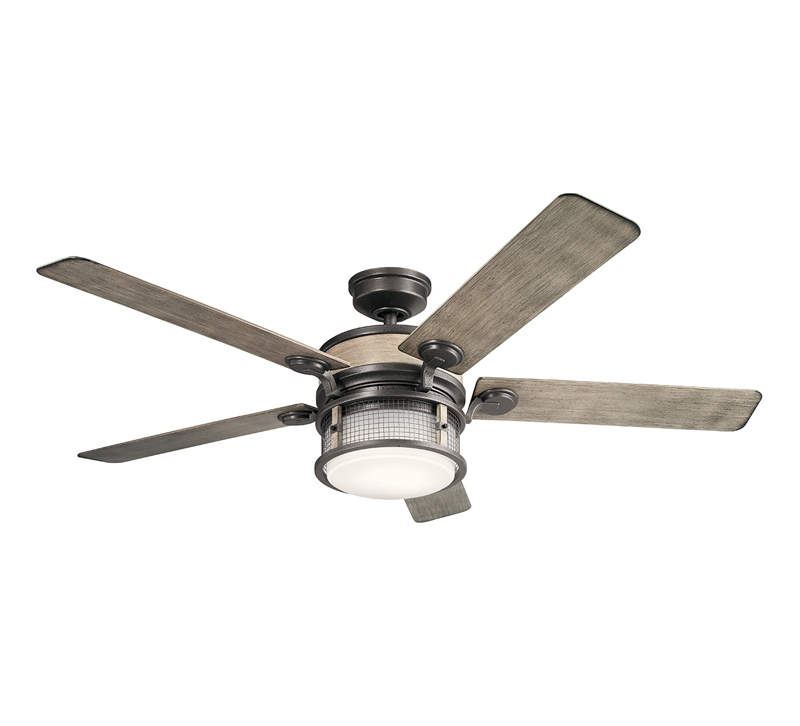 Prairie features an impressive 62-inch blade sweep with a recessed LED downlight in an aged pewter housing. Plus, the fan can cool on six different speeds. Style this windmill-esque beauty against white shiplap and furniture featuring different wood finishes. Fans of Kichler’s Ahrendale collection of interior and exterior fixtures (and there are many) rejoice: Now, there’s an Ahrendale fandelier to love. 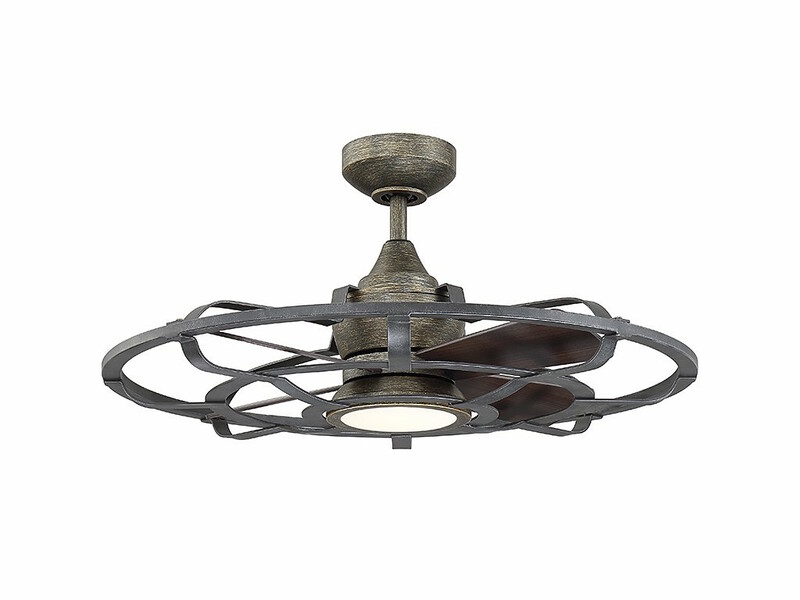 The new Farmhouse ceiling fan features industrial finishes like anvil iron (shown here) and an anvil mesh shade. While you could certainly outfit an entire room with this robust collection, we like this fandelier on a covered porch with a modern outdoor lounger and lots of greenery. Inspired by wooden wine barrels stored in the caves of French vineyards, the 22-inch Alsace fandelier by Savoy House is rustic chic at its finest. Don’t be deceived by its reclaimed wood finish, this design is full of modern touches like an integrated LED light source and white etched glass. 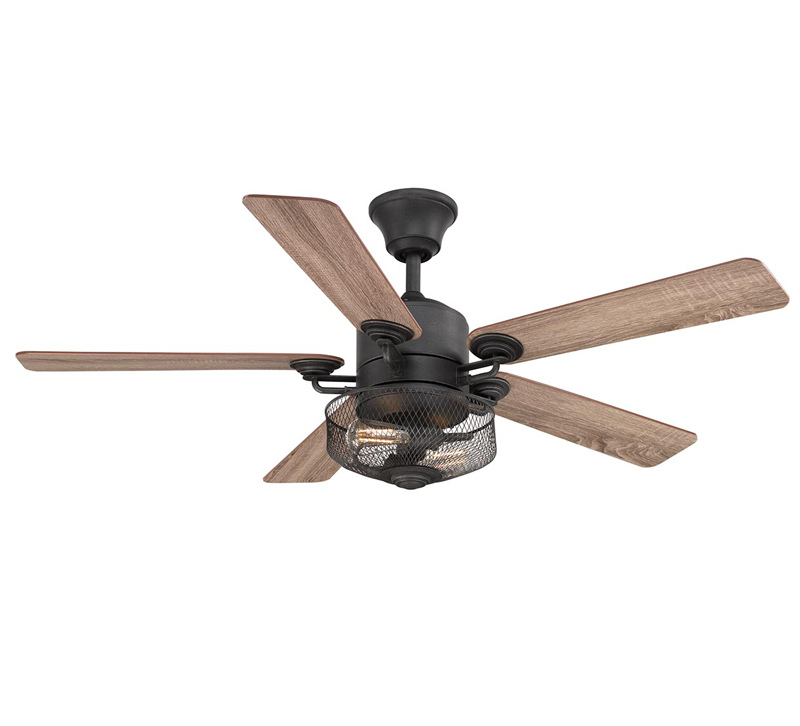 Small by ceiling fan standards, this design is a perfect fit for small rooms and covered porches thanks to its damp rating. When it comes to interior design decisions, the choices can be overwhelming. Why ask your clients to choose between two design styles when they can have both rolled up into one 54-inch package? 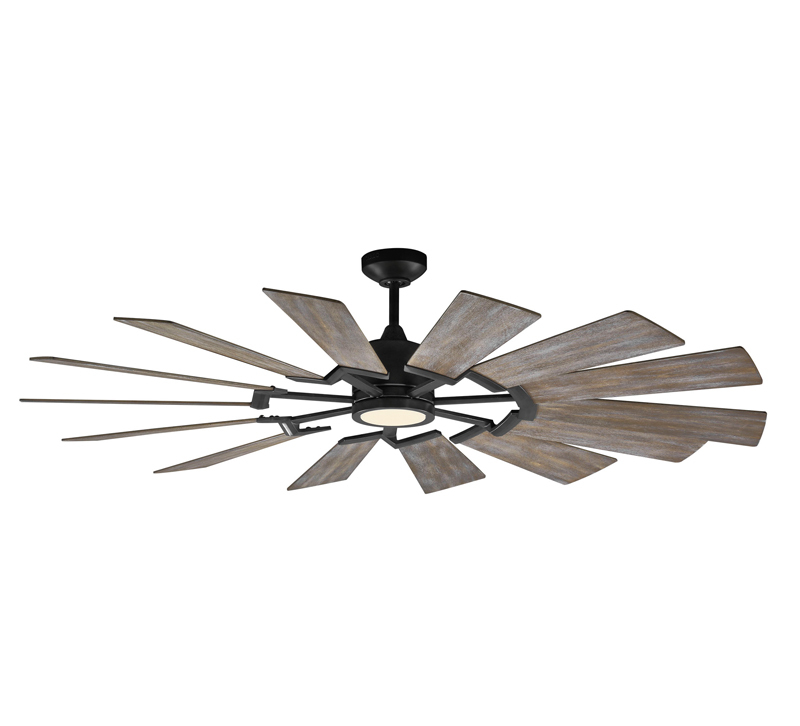 Rustic and industrial, the versatile Greer ceiling fan from Progress Lighting is the best of both worlds. The design’s best features include driftwood blades, a wire mesh shade and vintage-looking LED bulbs. Which of these fandeliers blew you away? Share with us in the comments!